Aaaand we’re back with the next Q&A by the Coffee Machine, where we get to know some of the staff members at Shelving, Inc. Mouse has been with us for a while, beginning here in 2010. 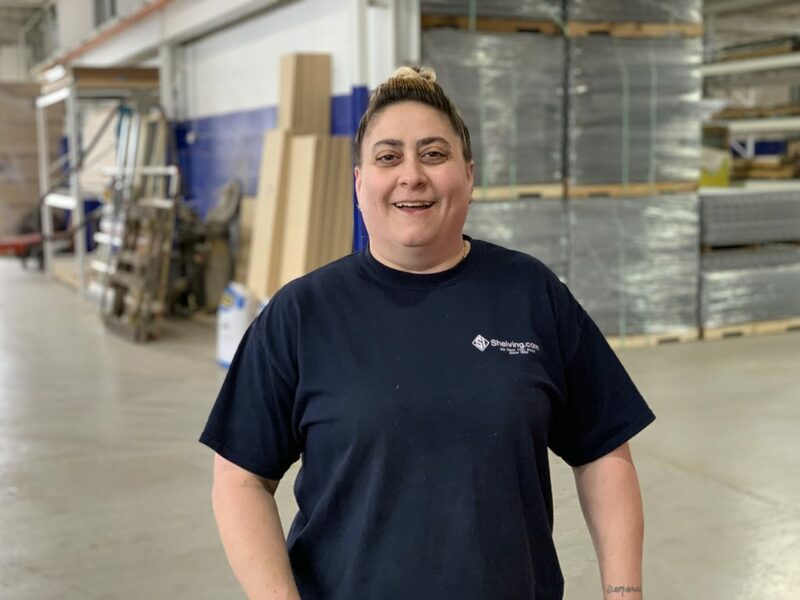 As our Warehouse Manager, she picks, packs, and ships customers’ orders, boxing their shelves with a little bit of love. Growing with our company over the years, she ultimately finds seeing the customer happy most rewarding. Before you ask—no, that’s not her birth name. Back when Mouse was a kid, she’d visit her mom who worked at a hair salon. To pass the time, she’d go in search of small spaces to hide—and with rather large eyes, the nickname stuck. When she’s not putting in work, you can find her bowling strikes with her son, Donovan, or heading to the shooting range. Favorite childhood TV show: Who’s the Boss? As the weather (finally) gets warmer, she loves a good family BBQ and getting rowdy at monster jam shows. Some may not know she got her motorcycle endorsement a little while ago, and adores the thrill of cruising around at high speeds. All in all, she’s most proud of being the best mom she can be for her son. Stay tuned for another Q&A in a few weeks!